Here are the beads I promised to show you...music beads with sheet music lines that are thinner than any stringer work I've ever seen on a bead! The artist is Saskia McKenzie-Fisher and she's not only talented but very sweet as well. 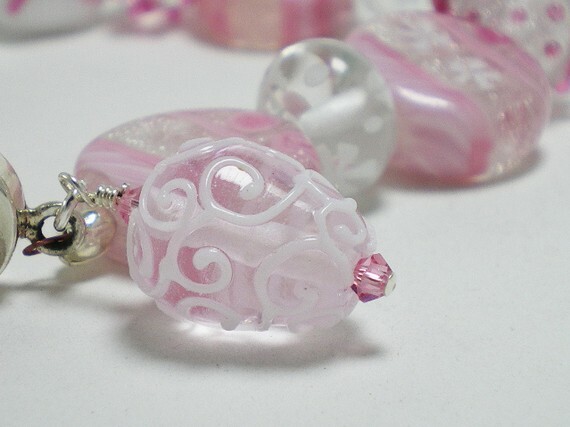 She made other sets in a pale pink glass and also in blue. I am so excited to get these into a bracelet. My husband said I just have to keep them for myself since they are so spectacular. I'm waiting for a few more of those small rosette rounds and once I get them and assemble the bracelet I'll show you pictures. Here is the Pink Snowflake bracelet I completed this week that is all pink and white glass with a beautiful Rose Swarovski crystal and sterling silver tab style clasp. The dangling bead is a fabulous scrolled egg shape that is a star all by itself. 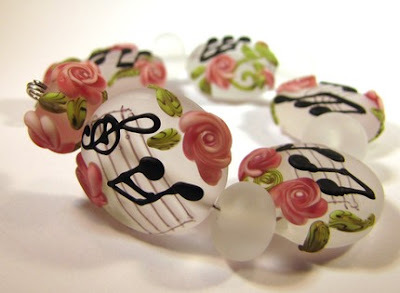 On my next blog post, I'll show you the final music note bracelet and (fingers crossed) the beginning of the new cupcake jewelry line I mentioned in the past. It's that time of year again...October, breast cancer awareness month. I love seeing all the pink items when I'm out shopping that shows just how much awareness there IS! As I watched the Philadelphia Eagles football team burn the SF 49ers butts, I couldn't figure out why the Eagles, a team that wears green and white, had a few players wearing really cool two toned PINK football shoes! Then I noticed their gloves were pink and then I saw the pink awareness ribbon on the team helmets and thought, wow, how awesome is it that we live in a time when men are willing to dress in pink. I just love that. I found out later they also had pink caps and had pink ribbons on the footballs. So I thought it would be a good time for me to remind you of the pink beauties I have for you. These are just 2 of the many items I carry in pink....all year long. It's my favorite color of glass bead to buy and just WAIT until you see the awesome pink in the beads I bought last night...they blow my mind. 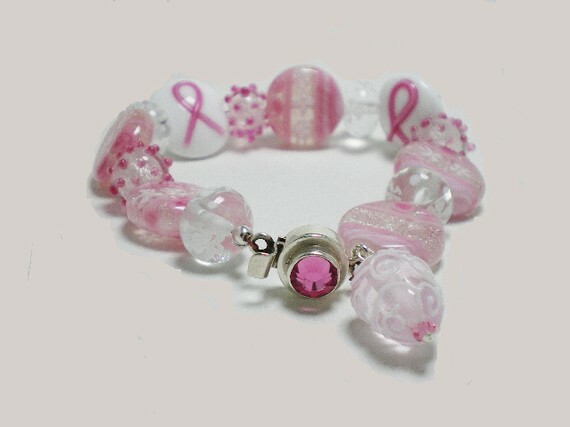 So be sure to do your part for cancer awareness this month....just about any item you might need could possibly be available in pink so that proceeds can fund the Susan G. Komen for the Cure foundation. So, dig around before you buy. I remember last year at Target they had pink vacuum cleaners! 1. IF you need foundation & concealer, put it on. 2. Use your blusher for ALL your color...cheeks, lips and under the brow bone. Don't freak out...if it's a good color for your cheeks, it's the right color for your entire face. Really...try it! 3. If you need eyebrow pencil, put it on. 4. Dab clear or tinted gloss over the color on your lips. 5. And finally, apply at least one coat of mascara. These steps won't make you look made up, but simply clean and fresh and in 5 minutes or less, no matter what your age. Yummy yummy...after the streak of hot weather, it was a blessing to enjoy our favorite soup from Trader Joe's frozen section...French Onion. Each box has 2 servings that are shrink wrapped. I used to place each serving in my one cup casserole bowls. When cooked, it fills the cup perfectly but there IS some spillage onto the foil covered pan beneath it. Recently, my husband brought home these nice big blue coffee mugs and they are now the perfect bowl as there is no spillage while cooking. Look how wonderfully golden the cheesy top turns out....yum! We had one day last week where time flew and I had nothing thawed for dinner. My husband suggested getting something quick at KFC...which is a rare place to visit for me. But I acquiesced and tried the chicken pot pie for the first time and man oh man, was that perfect crust ever beautiful and crispy. I don't EVEN want to know how much butter must have been in there! I guess I've needed a looooong break from jewelry. I just have not felt motivated at all. Don't know if it's the ever changing weather or what, but I've got all the materials I need for the completely new line of cupcake jewelry that I have hinted at so I hope when next I blog I'll have some ready for you. Now go get some soup!